Pour it on! Click on the image to get some Pure Vermont Maple Syrup for your family. 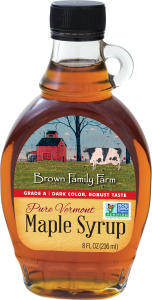 Pure Vermont maple syrup, exclusively produced in small batches by independent Vermont maple farms and local artisans—that’s what Brown Family Farm is all about. The result is simply the best Vermont maple syrup you will ever taste. The perfect gift… the perfect pleasure. Produced according to strict standards, we guarantee our Vermont Maple Syrup to be of the finest quality. So, go ahead and pour it on! Find your favorite Vermont Maple Syrup here! 100% pure maple syrup grades are based on three criteria—color, flavor and density. Contrary to popular belief, USDA syrup grades do not indicate a difference in quality or purity. Instead, the darker the color, the stronger and richer the maple flavor. All maple grades are of the same density. Like fine wines, it’s important to choose grades based on how you’re using the syrup and of course your taste preferences. Slightly milder maple flavor. Perfect for pancakes, desserts and cereals. Rich maple flavor. Great for pancakes or for glazing meat and fish.